I'm super jealous of my sister. She lives in Oregon, and always says that if you pay for blackberries in the summer, you've done something wrong. I love going to visit her for many reasons, but a plethora of blackberries is certainly up there. Here, blackberries are one of the more expensive fruits, but I love them so much, I buy them anyway. When I was searching for a margarita recipe to make over the weekend, I came across this one. There were several "interesting" combinations, such as celery, jalapeno, and pineapple-chile. This one was certainly different, but I was intrigued. The thyme was very understated, and I think just added a nice fresh and herbal note to the drink. 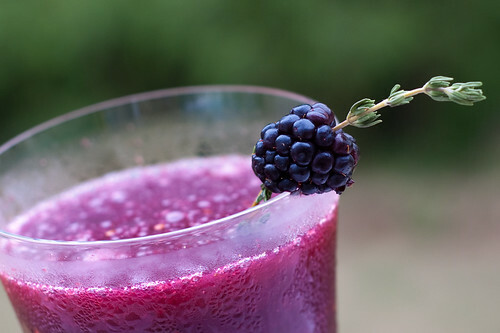 The blackberries gave the drink a gorgeous hue, and you can't go wrong with tequila, right? Place 16 of the blackberries in a food processor with the thyme leaves. Pulse 30 seconds. Push the blackberry puree through a fine-mesh sieve into a small bowl to remove seeds, pressing on solids to extract as much liquid as possible. Margaritas are my favorite drink by far, but I haven't tried much in the way of variations. This is a must try for sure! I love margaritas! Nothing better on a hot day to drink and yours are simply beautiful. The color is amazing! Mmmm... I'm loving this combination! 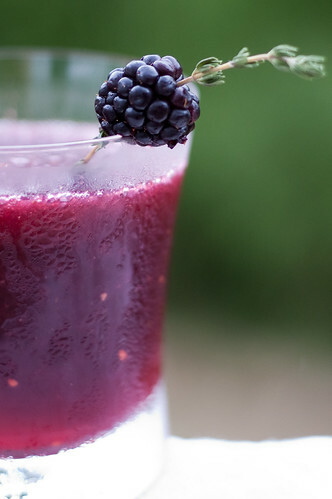 I'll have to try this out the next time I have blackberries in my fridge! This is beautiful! I will definitely be making this as the weather heats up. This sounds like an amazing margarita!!! Just made these tonight! They are as delicious as they are beautiful.